Providing loving care to all dogs, cats and exotic pets. The desert does hold some dangers for our pets that every owner should be aware of so that they can keep their pet safe. Some of these potential problem critters include: scorpions, spiders, bullfrogs, cacti (okay not a critter but nasty! ), rattlesnakes and insects including bees. Bullfrogs ( Bufo alvarius & Bufo marinus) – actually a toad. Bullfrogs (Sonoran desert toads) will come out in the valley at night after we have had a good rain. Many dogs seem to think that these toads make a good chew toy and they will lick and mouth the frogs. Bullfrogs have a salivary gland that produces a substance which coats their body and is toxic to mammals. 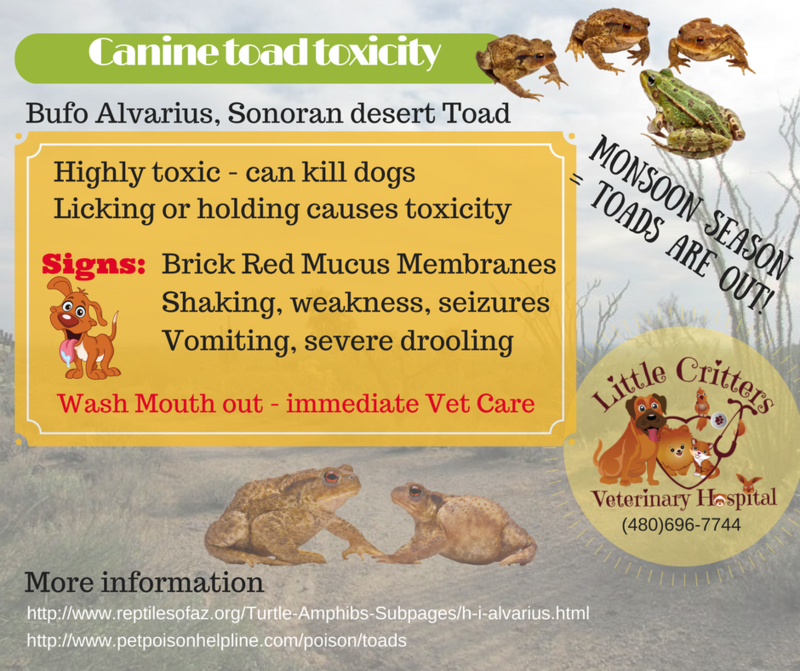 The dogs will absorb the toxin through their mucus membranes (gums) while licking the toad. Bullfrog toxicity can be very serious and will result in what is often described as “brick red mucus membranes” and salivation. Often neurological signs develop such as walking drunkenly, shaking or even seizures. If you see your pet mouthing a toad you should rinse the pets mouth out with water and your pet should be taken immediately to a veterinarian who will administer supportive care. The care involves giving medications for seizures or shaking, fluids for shock +/- fever and cardiac support. Scorpion stings are toxic to humans and animals and will cause local swelling and pain. Scorpions occur throughout the desert, although they do appear to often be clustered in certain areas. They hide under debris on the ground and will emerge at night to search for insects. Scorpions can be difficult to eliminate entirely and the best source of eradication is your local exterminator. Often spraying the house and yard on a regular basis to reduce the insect population will also reduce their predators, the scorpions. Snake bites can be a problem in the valley, but this will vary with the location and the time of year. In our area of the N.E. valley we do occasionally see snake bite victims. Usually the bite victim is a dog that found the snake too interesting to resist pestering. Fortunately, not all bites result in envenomation and not all envenomations are equally severe. However, all pets suspected of having been bitten should be taken to a veterinarian. The human antivenin is used in dogs, but the product is not commonly available at all hospitals and its administration in veterinary medicine is controversial. Many pets exposed to antivenin will develop a severe allergic reaction to it and conversely many pets bitten by a snake will recover fully without treatment. It is important to realize that as a pet owner you will not be able to predict the outcome of a bite and the single best thing you can do is to have your pet examined promptly after a known or suspected bite. Your doctor will complete a comprehensive physical exam and recommend the best plan of treatment for your individual situation. Also, if you regularly take your dog out hiking in the desert I’d recommend first putting the dog through a snake avoidance class. A link is provided below. I’ve also provided a link of contact numbers for snake removal from homes. Not sure if the snake you are seeing is dangerous? Look here for AZ Snake ID. See also this link for Snake Avoidance Classes snakesafe.com. One last comment, there is now a Rattle Snake Vaccine available but it is not a guarantee of safety and in fact pets bitten may still have to receive antivenin therapy. Read more here. Problem spiders in our area are the brown recluse (Loxosceles) and the black widow spider (Latrodectus). The black widow is shown on the left panel. Both of these spiders can cause disease in dogs and cats. The brown recluse bite will cause very severe local tissue destruction (necrosis) and the black widow bite will cause intense pain and neurological signs including muscle weakness and paralysis. Supportive care (support of body systems and prevention/treatment of shock) should be initiated as early as possible by your veterinarian. 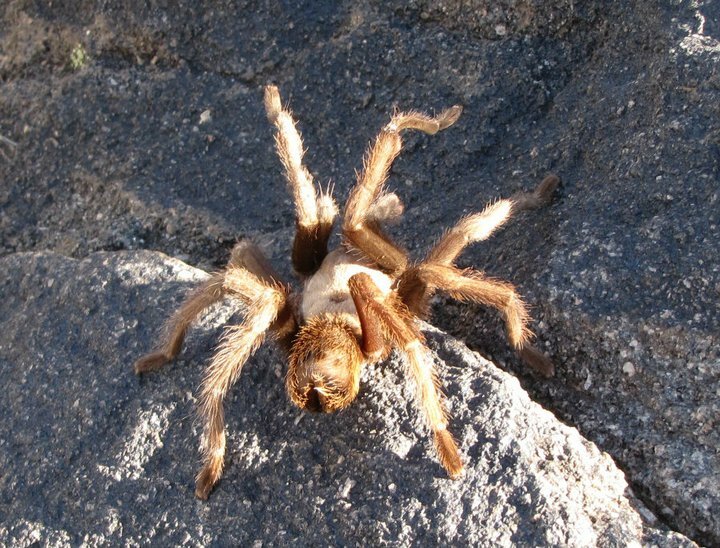 Tarantulas: these guys are of very low risk to you or your pets and should be left alone if encountered. They will not attack but if threatened are most likely to flick hairs ( like little cactus spine) from their rump. Are very low risk animals and should be left alone. The Gila Monster is the only potentially dangerous animal but will not attack if unprovoked. If your pet is bitten possible complications include pain, swelling, and infection. Veterinary therapy with medications may be needed. Another low risk creature that is not often associated with pet problems in Arizona. The bite can be painful but is of low risk to pets. Tarantulas are a very low risk to pets, but when bothered they can flick hairs off their rump which might cause eye or nose irritation. ​"Being admitted to the profession of veterinary medicine, I solemnly swear to use my scientific knowledge and skills for the benefit of society through the protection of animal health and welfare, the prevention and relief of animal suffering, the conservation of animal resources, the promotion of public health, and the advancement of medical knowledge. I will practice my profession conscientiously, with dignity, and in keeping with the principles of veterinary medical ethics. I accept as a lifelong obligation the continual improvement of my professional knowledge and competence."